I gotta say that I might feel strange knocking off a fancy French cheese product with a few items you can pick up at any old grocery store, but since I last bought Boursin, there’s been an explosion of products and various knock-offs, anyway. I wasn’t even aware that you can buy little snack cups of Boursin, now. So guess what – from now on there’s no shame in my game! When Boursin cheese first came on my radar, there was only one flavor, which the Boursin website describes as “Garlic & Fine Herbs.” It’s utterly delish, and the ingredients are listed right on the package. And so my recipe follows those ingredients closely for a fun, luscious spread. The key ingredients is the White Pepper and that’s what’s going to give your Easy Homemade Boursin Cheese a lift. White Pepper is on my Top Secret Super Stealth Arsenal of Ingredients post so don’t be tempted to leave it out – it’s what makes the magic happen in this simple but scrumptious spread! But what else I noticed when I visited Boursin’s website is that there’s also a whole bunch of other Boursin cheese flavors. I just need to stop being so focused at the grocery store and look around now and then! I think I’ve been shopping the same stores so long I know exactly what I want, exactly where it is and I just don’t take those long strolls through the store that some people do, thinking about what they might make or buy. So it passed me by that Boursin now has, in addition to the original Garlic & Fine Herbs, Shallot & Chive, Basil & Chive, Pepper, Cranberry & Spice, and Red Chili Pepper flavors. You can take this same basic recipe and alter it for any of those or any of your own flavor profiles. Gosh, you’re limited only by your imagination (and good taste!) If you still want to stick to the basic garlic/herb profile, you can add all kinds of things, to it, too. Anything from other favorite herbs (actual “fine herbs” includes tarragon and chervil, too, to a little citrus flavor with lemon or lime zest, or maybe just some good black pepper. One thing to mention about the Easy Homemade Boursin Cheese as opposed to actual Boursin, made with the Gournay cheese is that it is super creamy and rich and it is a little smoother than actual Boursin. Real deal Boursin is creamy, too, but can be just a bit crumbly, kind of like the texture of a really creamy blue cheese. I’m all about the flavor, but I just thought I might give that a mention so you know. I used cream cheese and butter as the base of my Easy Homemade Boursin Cheese, and I’ve made this before with regular cream cheese and with the light cream cheese, Neufchatel, and it’s fantastic either way. I have also made my Easy Homemade Boursin Cheese in the past with both fresh herbs and garlic and with garlic powder and dried herbs, and honestly like it better with the powder and the dried herbs. And that holds true especially if I’m going to be keeping it more than a few hours in the fridge or want to make it ahead. The fresh garlic intensifies in flavor over time and takes over and the fresh herbs just don’t hold up as well as the dried do. It’s worth mentioning that I have a huge pot of parsley and chives on my windowsill and I still prefer the dried for this! Since I didn’t have any dried chives, I just chopped some up, laid them on a piece of parchment and microwaved them at 30-second intervals, stirring after each, until they were dried. Either way, though, I mix the cheese, butter, salt, white pepper, and garlic powder all in the food processor and then add the herbs and stir in by hand. That way, I don’t have a green dip. 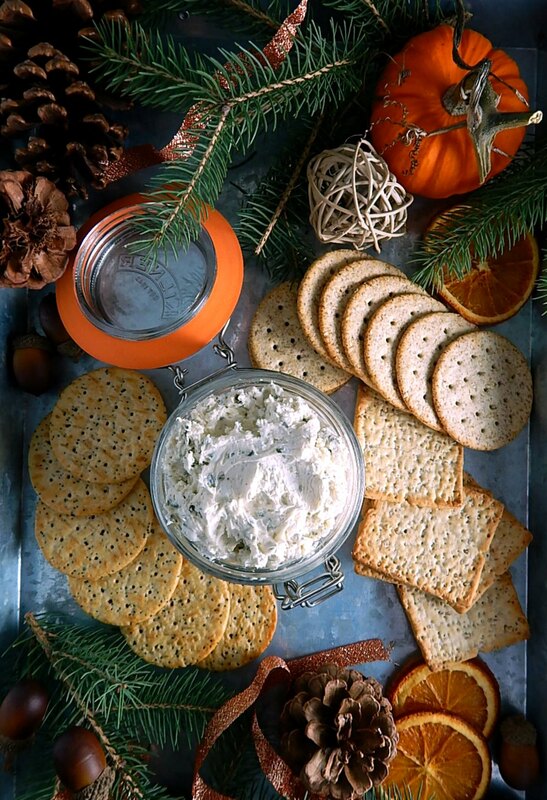 Any holiday is a great time to save money on many items, especially Cream Cheese. Now that we’re smack dab in the middle of the Winter holidays, you might want to check my list of items to stock up on. I just stocked up on Cream Cheese, four packages for $5.00 and since it keeps so well, I bought enough for the Cheesecake I’m making and enough to last through the holidays and beyond. I use the same strategy to find butter at a low, and both items freeze well, too. That means my Easy Homemade Boursin Cheese, which is 20 ounces, runs about $2.75 plus the garlic powder and herbs at the sale prices. Even at regular grocery store prices, in my area, my Easy Homemade Boursin Cheese runs about $4.69. That sounds pretty great compared to $3.99 for 5 ounces for the actual Boursin Cheese. If the Boursin cheese were the same volume as the homemade, you’d be paying $15.96. So let’s talk a bit about what you can use your Easy Homemade Boursin Cheese for if you happen to have any leftover. Toss it into mashed potatoes, make twice baked potatoes with it. Thin it with a bit of milk or buttermilk for a super creamy dressing. Add it to a pasta dish. Combine with spinach and stuff chicken breasts or mushrooms. Use it on a sandwich, spread a bagel with it, with or without salmon. Once you taste your Easy Homemade Boursin Cheese, you’ll realize the possibilities are endless. About 5 minutes to whip up, but make sure to allow time to soften cream cheese and butter. Preferably in a food processor, mix together the cream cheese, butter, garlic powder, white pepper, and salt. By hand, stir in the parsley and chives. Best if made ahead so the flavors will blend. If refrigerated, bring out ahead so the cheese will be soft enough to spread. If desired, the cheese may be formed into rounds to mimic actual boursin. I’ll be sharing my Easy Homemade Boursin Cheese at Fiesta Friday #250, cohosted this week by Jenny @ Apply To Face Blog., Jess @ Cooking Is My Sport, Jhuls @ The Not So Creative Cook and Judi @ cookingwithauntjuju.com. Thanks, guys for hosting for us for so many Fiesta Fridays! #250 is a landmark for sure! This entry was posted in Click here for Fabulous Food Posts and tagged Appetizer, Cheese, Cream Cheese, Spreads and Dips. Bookmark the permalink. How did I miss this?!! I started making something similar when we couldn’t afford Boursin. And I still make it. It’s called Faux Boursin on my blog. So smart to make it like this. Oh, I will go look at yours, too! I think maybe the price has come down but it isn’t cheap! No, definitely cheaper to make at home. Looks great. How big is a package of cream cheese for your non-US readers? Hi Melissa, I’m glad you asked because I noticed I had a typo, too, which I corrected. 2 (8 ounce) packages here are going to about 453 grams total, if my calculator is correct! Pingback: Homemade Savoury Boursin … Spread and Pasta Sauce | Cooking is Fun … Really!! So much yes! Will be trying this. Bookmarked. Thanks~ I hope you enjoy it. I was just going to have the last little bit on crackers and set it on the coffee table so I could have it while watching a sappy movie when my lab swooped in and got it. So now you know, it’s lab approved! Made this to take to a friends house tonight– but I’ve been sampling it with crackers– delish! thanks Mollie. Merry Christmas! I’m excited about this one Mollie– love love Boursin cheese– but I’m pretty much a big cheapskate and hate buying it! I do occasionally for a chicken recipe that uses on e package. Anyway– thanks thanks! I’m trying this before Christmas. Would be fun to serve when the kids are home. And yes, I will go buy the white pepper! You’re the best! thanks. And did it snow on your today. Our kids flew back to Wisconsin this morning and said there was a snow storm brewing… hugs from here! We were so lucky, it just rained and rained for days…I kept thinking a couple degrees colder and we would have had such a nasty blizzard. I think you’ll like this! It’s so delish. I haven’t tried side by side with real boursin, but I do love this! Sounds promising Mollie!! You’re my most trustworthy recipe source! thanks! Thanks, Rhonda! That’s so sweet to say! It’s not quite the same thing but really is a close second and so easy, too! I have some cheese boards on my menu for a few upcoming events and this would be a great addition. I love that I can save money and make it easily myself! Carlee, I think you’ll love this. A friend made it over thanksgiving for her cheeseboard and said people were asking where they could buy it. Whaaat, you can make your own boursin cheese?! I just bought another one to replenish our supply; it’s one of those things we must have in our fridge! Along with the boursin, I also bought a jar of pickled herring. I thought they would go nicely together. What was I thinking?! What a great alternative. The store bought is so expensive. It’s such a treat and you’re so right!! Happy Thanksgiving! Mollie, you just saved me some money! I have Boursin cheese and ripe avocado on toast most mornings for breakfast. Your version will be about half the cost of the Boursin. Now you got me thinking, what if one used goats cheese instead of the butter. I’m trying both ways. Hi Ron, it’s not quite exactly the same but still so very good. It really is the white pepper that makes it! Hi Robin, it’s so creamy and cool and delish! Thanks! Great idea, and I like the idea of making it ahead and freezing. I like it stirred into mashed potatoes or scrambled eggs. It also makes a fantastic pasta Alfredo mixed with heavy cream. Oh yes, scrambled eggs! YUM!! PS: If you freeze and then thaw cream cheese, it becomes crumbly. I wonder if making the home made Boursin ahead of time, freezing it and then thawing it to serve at Xmas would approximate that ‘crumbly’ texture. You might be on to something there with the freezing! To tell the truth, I usually don’t pay too much attention the the dates, at least down here they don’t really seem to matter.